It has been quite a while since I posted an update from the Haven. Progress has been slow, due to weather conditions. Gales in May brought down several large trees, and 3 weeks of constant heavy rain and thunder storms in June and July stopped progress in the “Hint of the Orient” garden. This is a July pic down by the stream. Normally, this would be a trickling rivulet, with many stones visible, and the odd brown trout. Instead, the raging torrent swept away part of the banking, and I lost several grasses, and also some geraniums kindly sent by GoYer Amy, as well as successfully sown seeds of blue Lobelia and Ligularia sent by Lori all the way from Ontario. I still haven’t quite got over this tragedy, but am just so glad that I didn’t sow all of Lori’s seeds, and am about to try germinating some more. More gales in September brought down more trees, which had to be slowly cut up and removed from the stream banking. 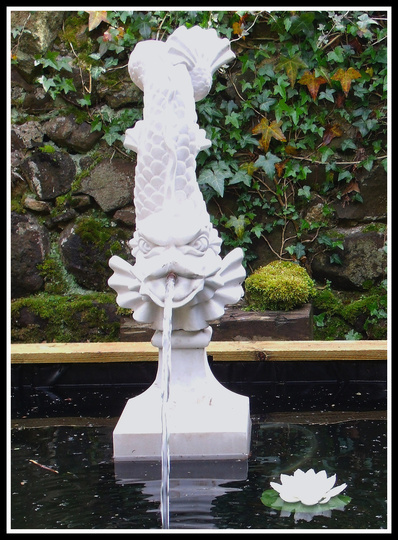 One of my last blogs showed the construction of a lily pond with an oriental-looking water feature. We never did get around to getting plants for it this year, and Squire and M’lady are still debating whether to have fish in it.They have also decided against the trick of painting it with yoghurt, in an attempt to get moss to grow on it, so that it might age and blend in with the mossy wall behind. 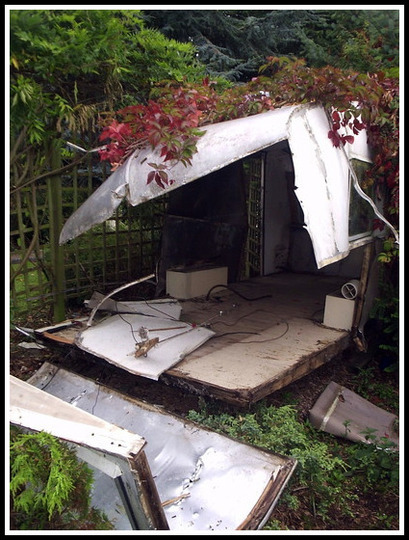 After building the pond, my next project was to construct an adjacent decked area, where an old caravan had stood. The weather frustrated me, as it made a relatively straightforward project stretch well beyond the proposed time schedule. Getting the deckboards to the Haven atop Squire’s car (the timber yard simply would not deliver along the mile-long tractor track) took up a whole day alone. 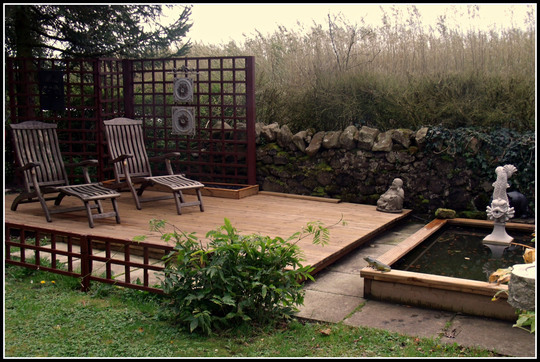 The decked area measures just over 16ft by 11ft, and is sufficient for the 2 steamer chairs and a small drinks table. This area is a real suntrap for most of the day, and there is sufficient space to move the furniture around, as the sunshine dictates. I was glad that we did, at least, have one late summer mini heatwave. Received several text messages from M’lady on those days, mainly reporting that she was opening her 2nd bottle of champagne by noon, LOL! I would reply to the effect that, like the 5th -10th boards in from outer edge, hope that she didn’t have any screws loose, as those boards didn’t yet have all theirs in place! I re-used all the trellis panels which previously supported the rather wild Wisteria up and over the caravan. I have re-erected them in a form resembling an old folding screen, as dictated by the roots of the conifer tree behind, painted it all to preserve, and hung some garden artowrk upon it. I made a corresponding planting area for climbers, which will be of Oriental origin. The low “fence” dividng the area from the grass was made from more recycled trellis. 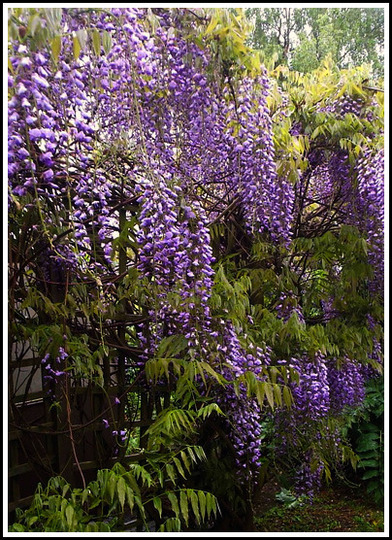 As many of you will know, it is almost impossible to totally kill off a Wisteria. down to remove the wreck. I am currently training its tendrils along this low fence, just to break up the area a bit. It was this huge old Wisteria, after all, which gave us the idea for a “Hint of the Orient” area. This brings me to last week, when M’lady and I went on a shopping trip to a very nice, privately-owned GC, to buy 4 6ft tall Bamboos to screen off the rather old, rundown wooden garage. We spent well over an hour choosing 4 healthy specimens, before making our choice. Then… M’lady spotted the Buddhas! Trying to make her choose just one was “Mission Impossible”, as she just had to have one of each!! And, so, now there is……. 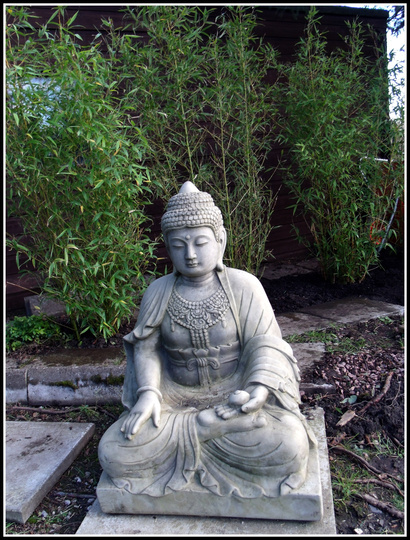 …and this 3ft tall one, which is my personal fave, with the 4 Bamboos (Phyllostachys aurea) now planted behind. So much for a “hint” of the Orient!!! Still, as said b4, it is their garden, not mine….and it was great fun going shopping with someone else, and not with my money!! 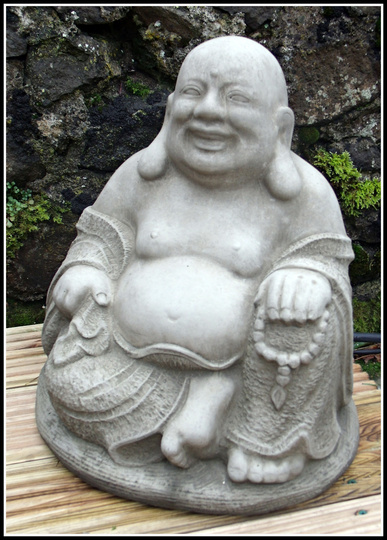 The area around which this last Buddha is seated is to be made into a raised border, mulched with gravel or slate, and with minimalist planting of Oriental grasses or Azaleas……..well, that would be my “vision”, but, of course, anything could happen! Welcome back David! Sorry you lost so many things to the awful weather and the raging torrent. You are doing a great job there! The sun patio looks wonderful, as do the bamboos! Yes welcome back David. You are making everything look great. Wonderful job. Like it all. Glad to see you back David. M'Lady is very lucky to have you on board for all the work being done around their garden. I think a coating of yoghourt would work wonders on the fish in the pond but it won't be necessary for the lovely lady in your last statue pic. 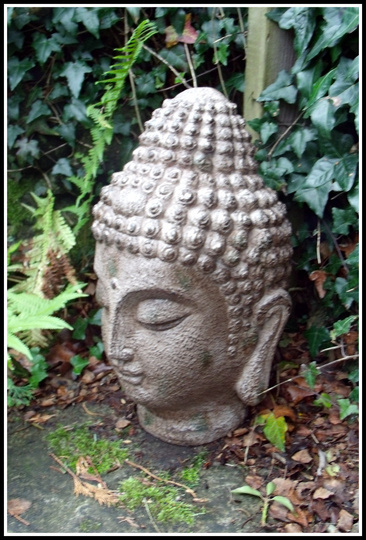 I would love something like that in my garden.She looks so serene. I'm so sorry to hear about the loss of the plants to the stream. Looking at it when you first showed it it is almost unbelievable that this raging torrent is the same stretch of water. At least you now know to avoid planting in that flood plain area again. I have some spare lazula sylvaticus, if that is of any use to you for your oriental garden. Hello David and welcome back, gosh that stream has turned into a river, hope you are not too disheartened, it might go the other way next year, it will be interesting to see what happens then. I do like your decking area, sounds as though M,Lady does as well especially with her glass of bubbly close at hand, lol. Nice to hear from you David. You've been busy with the garden. That stream looks dangerous. We've had a wet cold summer here aswell. The decking area is lovely. I notice the avatar has changed ~ is that a clue for the new theme David? That stream turned into a torrent didn't it ! You've been very busy... decking area looks lovely..
Are your children getting even more interested in gardening as they grow up ? Have they come up with new theme ideas ? Time has flown since May hasn't it. You have made a lovely area there by the pond. Such a shame you lost those plants by the river. My daughter has the figure in the last photo in her oriental garden. It sits underneath her japanese acers and surounded by azaleas. Nice to see you back, love the changes you are making and all the planting, how's your garden coming along these days? Many Thanks for all your lovely comments, folks! Hello stranger welcome back :o) gosh you have worked miracles, I'm sure M'Lady and Squire appreciate your hard work and commitment to doing the job properly ,I hope they occasionally share the Champers with you !! I have one of those frogs we bought it for the grandchildren they are fun ! Hi there nice to have you back, think we've all had a bad summer, but your garden looks lovely, well done. My ears must have been burning, Lincslass and Karen! :-)) Our own garden fared badly, too, and haven't had much time to devote to it as would have liked. The children still like the pirate theme, however, so will be making plans for full steam ahead with some new ideas we had. Hi Tt. They do still enjoy gardening and have been getting involved with it at their school. Am very proud of them! Many Thanks, Motinot and Clarice. It's great to have time to be back again - not that I've been very far away. I have lots of lazula David so let me know its not going anywhere. You have had a very busy summer by the sound of it! 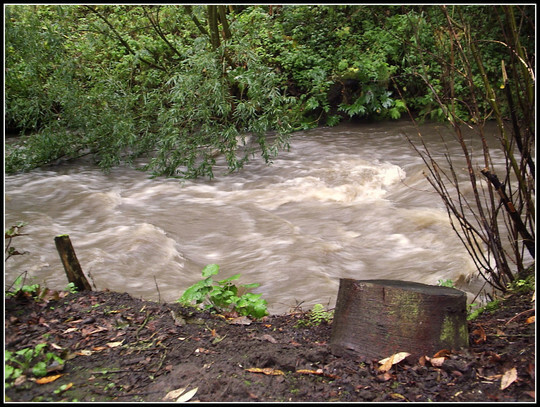 Shame the rising torrent swept away some of your plants from beside the stream! I've seen in Spain what can happen to a little stream after a thunderstorm! It's frightening just how fast a placid little stream can become a raging torrent that sweeps everything moveable before it! We were witnesses to a similar event 2 Christmases back when we went to visit our family in Cuenca. The little "river" that runs below my mother-in-law's place ("below" being a couple of 100 ft!) became a raging torrent in half an hour or so - it literally grew from being a couple of inches deep in the centre to a foaming, mud laden torrent more than 3ft deep! Fortunately it's well protected at its pass through the city to its merger with the big river with high walls at least 10ft high much of the time. Its soooooo nice to see you back David, have missed your 'haven' blogs very much. Wow that water is jolly high in that stream there, scary really how our weather can change so rapidly. The garden looks fab and I love that deck, did you take any photos of all those thousands of bulbs you planted? Would be nice to see them, some day. Keep up the good work & spending!!! hello David, good to re-connect again. I took the summer off from Goy to go on my travels so it's catch-up time . Looking forward to the Winter conflabs, quiz's & general mischief keeping us from thinking too much about the cold indoorsy season. Like you I too have changed my avatar, sold my old blue V-Dub so it was time for change. We are all fine, right now, Thank You. Have been amazed, to be honest, by how much was lost, both at The Haven, and at home. Have had Cordylines, phormiums and hardy grasses for years, but lost the lot. Was astounded when they all seemed to have survived the unusually cold winter of -14C, but the unseasonal gales in May finished them all off, and anything else we had newly planted. hi David sorry im late but nice to hear from you and hope all is good for you and the children. 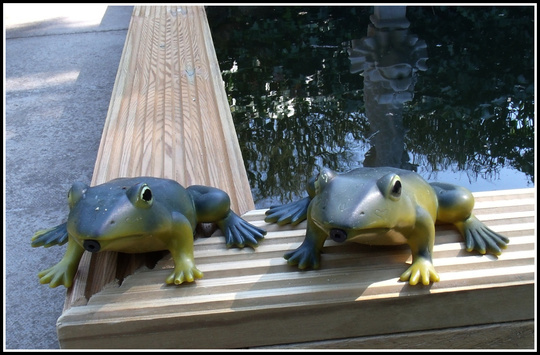 love the frogs and deck to. Hi Sandra, and Thank You for dropping in here (must catch up with what everyone has been doing this summer). Eilidh was in hospital for a few days last week, she really wasn't well, but is fighting fit again. James now under the weather with a virus - never a dull moment! This area has definitely proved a hit with the owners, and it is quite fun to listen to their plans for developing it further. What a lovely decked area, David! And that Wisteria, wow!